I always get excited about a new adventure, but this wasn’t going to be any ordinary adventure. It was going to be an extraordinary adventure, even though I was going to a city where I had lived most of my life. That’s right, we were going back to Geneva, and I was going to have a chance to see my friends and family again. You have to remember that before I began my adventures, I had never been away from my family for more than a few days on class field trips. It hadn’t been difficult on those trips because I went with my friends from school. That all changed when I began my adventures, and although I have been half way around the world, I had never been back to Geneva. I was looking forward to seeing my family again, but I was also excited about the chance to tell everyone about my adventures. My grade 3 friends in Stittsville knew about every one of my adventures, but I hadn’t been able to tell my family or my friends from bear school about a single adventure. I was definitely excited. This was certainly not going to be a typical adventure. In a new city I often rely on my traveling companion to give me hints about what to expect. Not in Geneva though, where I was the expert, and he was getting advice from me. Typically I stay in the same hotel as my traveling companion, but in Geneva I wanted to stay with my family. In fact, for most of the trip I didn’t see my traveling companion at all. And on most adventures I meet lots of new people, but this time I was meeting old friends. Mind you, they were still the same old friends, but as we talked I realized that I was not the same bear I had been. So even though I didn’t think this would be like my other adventures, in many ways it was just as exciting and unpredictable. The day I arrived home, my father gave me a big hug, but warned me that we might not be able to spend much time visiting. Apparently there was a major conference being sponsored by the Aboriginal Bear Committee, with bears visiting from all around the world. He works in security for the ABC, so he had to work overtime during the conference. I was disappointed, because I’d really wanted to see my father. I asked if there was any way I could attend the conference. He shook his head sadly, and said there were already too many bears from Switzerland attending this conference, so it really was out of the question. I thought about that for a moment, and then I had a brilliant idea. 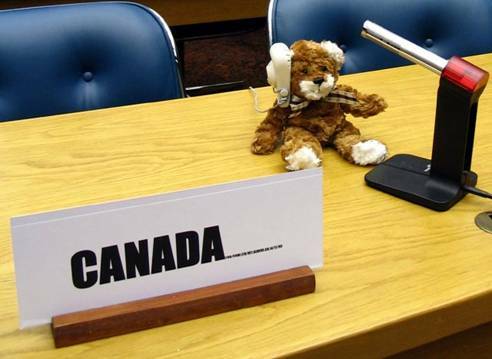 Was it possible for another bear from Canada to attend the conference? He looked confused for a minute, but suddenly he understood what I was thinking. I was living in Canada now, so perhaps I could represent Canada at the conference. He slowly nodded his head, and told me he would have to check, but it should be possible. That is how I came to be representing Canada at a major ABC conference in Geneva. These conferences are formal events, co-sponsored by a little known branch of the United Nations. The conference rooms have special seats for each country, and you can only speak when you have been given permission. I suppose that sounds a bit like being in grade 3, but it isn’t quite the same. For one thing, they have special microphones and ear phones so all the bears can hear what is being said. Another difference is that there are no right or wrong answers. I know that sounds strange, but the conference was all about trying to understand the special needs of bears everywhere. I found it interesting to learn about other bears challenges, and I think I had some useful things to say, especially about the unusual needs of traveling bears. But the best part was that I was able to spend extra time with my father during the day. My father works for security, so I was also able to stay late with him after all the other bears went home. 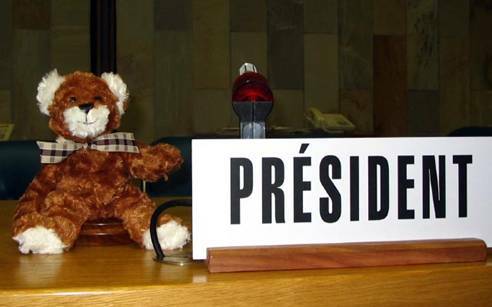 That was fun too, because I was able to pretend that I was a very important bear at the conference. I even sat at the President’s table once. It looked a bit frightening from up there, so I don’t think I’ll do that again. I’m glad I did it once though. I was able to see many of my old friends from bear school while I was back in Geneva. Most of them already had jobs, but some of them were still going to school, studying for special professions, like being teachers. That did sound interesting, but not as interesting as being a world traveler. I was the only bear who was spending all his time having excellent adventures. It made me realize how very lucky I am. On my last day in Geneva, I took my traveling companion for a walk past my old bear school. 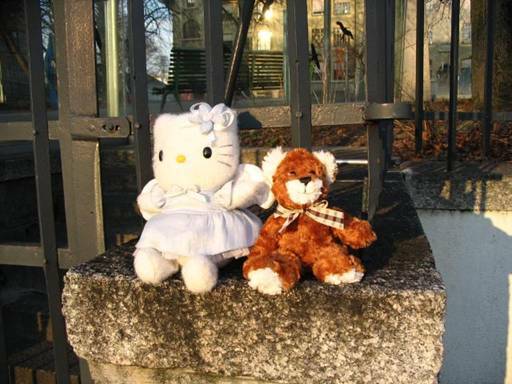 I’d seen many of my old friends, but not all of them, so I was thrilled when I saw Hello Kitty outside the school. I rushed over to give her a big hug and say hello. I know what you are probably thinking. Why did Hello Kitty go to bear school? You have to remember that there are many international visitors living in Geneva and attending the local schools. We had bears from all over the world at our school, but we also had some exchange students who weren’t bears. Hello Kitty was one, and she was very popular at the school. It was great to see her again, and catch up on what she had been doing. It turned out that she had been traveling around Europe since the end of school, and had many interesting stories of her own to tell. We sat on a bench by the school as long as we could, and shared stories about our adventures. My trip to Geneva ended all too soon. As we flew back to Canada, I wondered where, and when, my next adventure might be.